The Statue of Liberty is 450 000 pounds of awesome. The robed female depicted is Libertas, the Roman goddess of liberty, bearing a torch and a tabula ansata (a tablet of laws). The gift from France was designed by Frederic Bartholdi but the size and weight of it required special engineering. For this Alexandre Gustav Eiffel (the same Eiffel that designed the Eiffel tower) designed a massive pylon system that supports the frame. This Frame then supports the skin of the sculpture. It was intended to mark the centennial of the Declaration of Independence, with it's date inscribed on the tablet Libertas is holding. However, due to funding constraints and scheduling, the project was delivered ten years late. 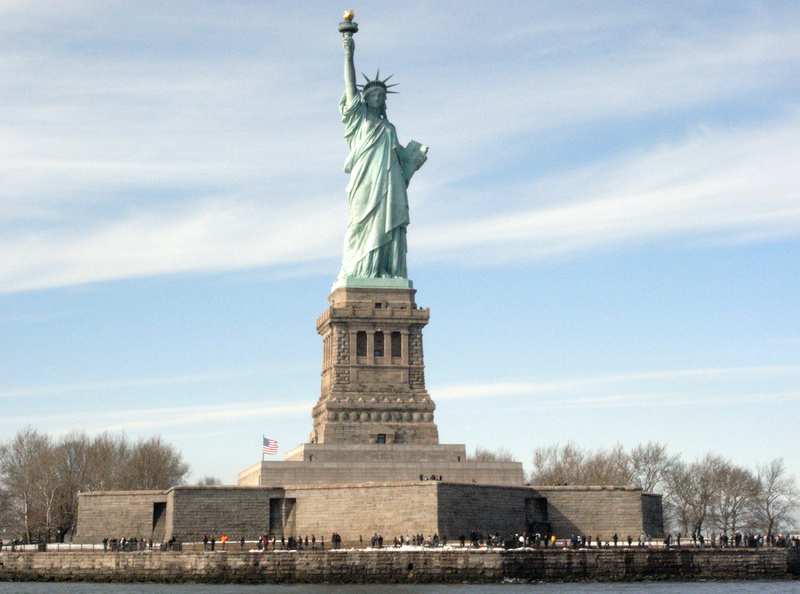 The statue is located on Liberty Island, a short ferry ride that you can catch from Battery Park. The ferry makes stops at both Liberty Island as well as Ellis Island, the later being a former immigration processing station where almost 100 million Americans can trace their roots back to. A self-guided audio tour is included with your ferry ticket to Liberty Island. Exploring the grounds with the audio tour takes 30-40 minutes. Inside the statue there are two levels, the monument itself, containing a museum highlighting the history of the statue, and 154-steps above that via a narrow spiral staircase is the crown which is the highest observation point, situated at twice the height of the pedestal's observation deck. While the view is good and provides a panorama of the island, it's not the Empire State Building by any stretch of the imagination. The per Admission to the crown will costs an extra $3.00 and has a limit of 240 people per day so make your reservations as early as possible. Although there is no entrance fee to the monument (except for the $3.00 reservation for the crown) in order to get there you must purchase a ferry ticket which is $18.00 for Adults, and includes access to Ellis Island.